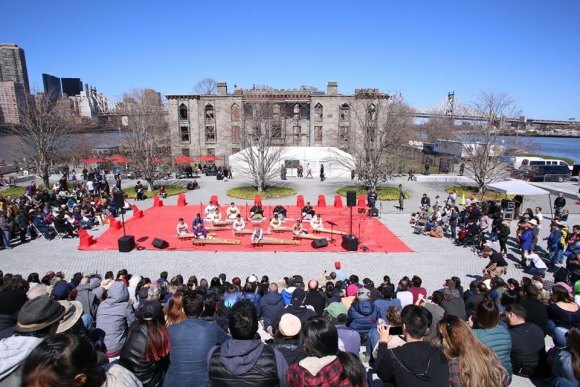 Performances, FDR Four Freedoms Park at Cherry Blossom Festival 2018. 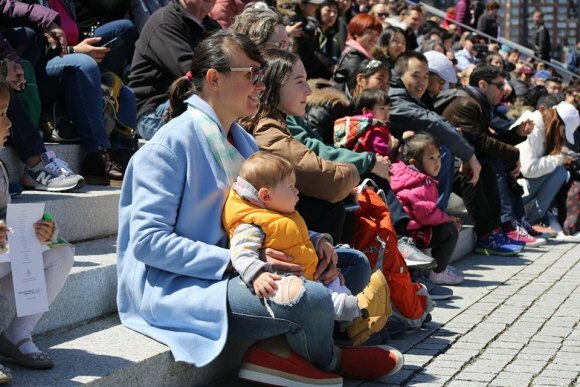 Although the pace has been laggardly and the process ragged, sponsors and organizers of Roosevelt Island 2019 Cherry Blossom Festival seem to be tightening up in time for Saturday's event. Changes begin at 7:00 tonight. The Weather: As of now, soaking rains tonight are expected to end before daybreak on festival day. Saturday will be mild but cloudy with a high in the mid 70s. Lingering humidity and scant help from sunshine means you should prepare for soggy grounds and some puddles. Food: FDR Four Freedoms Park notes that, while food and drink are allowed in strictly limited spaces inside the park, ample opportunities abound for picnicking along the cherry blossom ringed Promenades leading up to Southpoint. None of the hosts or sponsors released any information about food vendors, but you've gotta eat, right? The café at Cornell Tech, in the Bloomberg Building, with easy access along the West Promenade and ample indoor and outdoor seating, offers a themed Yakitori Grill menu for hungry festival goers, starting at 11:00. Otherwise, on Main Street, north of the Subway, you can grab some takeout from Nisi, Wholesome Factory, Fuji East, Subway, Starbucks and China One. On its website, RIOC now has a page detailing arrangements for security and traffic outside the festival. And FDR Four Freedoms Park, which gets credit for making the event happen at all, posted a well-organized event page, weeks ago. But first, you need to get there. Kids in traditional garb perform, Cherry Blossom Festival 2018. By Subway: You had to expect the MTA to fumble, once again breaking a promise to leave F Train service alone until the Tram's back at full service, and the State agency doesn't disappoint. There will be no F Train service for Roosevelt Island. Fs will be detoured along the E Line. In fact, there will be no 6th Avenue service in Manhattan on any line. Partial recovery -- Between 21st Street/Queensbridge and 63rd/Lex, with Roosevelt Island being the tasty morsel in-between, E Trains will run on the F Line in both directions, all weekend. Be prepared, though. After 63rd/Lex, Es go off on the R Line, that is, Broadway Local. If you're coming here from anywhere beyond the most immediate subway stops, grab an E on its normal route in Queens, and if you're in Manhattan, pony over to Broadway to catch a ride. By Tram: RIOC quietly (?) announced big news that both Tram cabins will be in service during the festival, although specific hours were strangely missing. Expect the hugely popular Tram, sporting sky high views of cherry blossoms necklacing the Island, to be jammed with long lines possible, even with both cabins going full time. Motorgate Parking: "Visitor parking at the Motorgate garage will be limited to ensure adequate parking for residents and patrons with a monthly permit. Residents without a monthly access card should be prepared to show proof of residency when approaching the Roosevelt Island Bridge at Vernon Boulevard." RIOC advises that, in addition, expected heavy traffic and security concerns mean access to the Roosevelt Island Bridge may be limited. Security Checkpoints: Public Safety Department officers, augmented by outside security, will set up checkpoints, starting at 10:00 a.m. on both loop roads south of the Tram Plaza. Soft bag checks will be made. NO Camera tripods or lighting equipment. NO Portable audio systems or speakers. Now, you've got all the details we have from every source we can scare up. 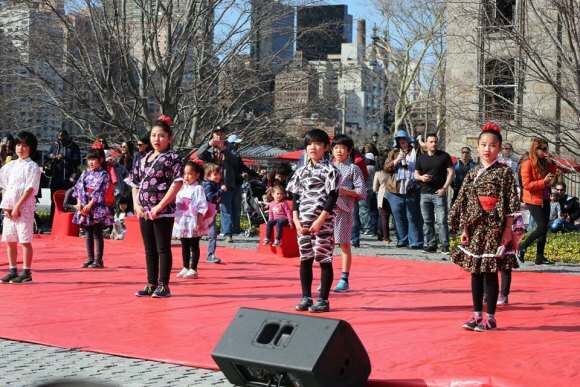 Have fun in Roosevelt Island's annual festival celebrating our glorious cherry blossoms and Japanese culture.